While out shopping a few days ago I saw a young lady, probably in her mid- to late-twenties, wearing a T-Shirt that proudly proclaimed, “I STILL LIVE WITH MY PARENTS”. At least, I’m guessing she was wearing it of her own volition. I could be wrong. I could actually see some parents using that shirt to — well, never mind, that’s not the point of this post. The point of this post is to say how much I am enjoying MY empty nest. Oh dear! Now that I actually see that written down, it sounds a little like I’m gloating, and I’m not. Really. It’s more like reveling, or maybe rejoicing. Yes, rejoicing, that’s it. As my youngest child neared graduation from high school, and started making plans to attend college in another state, family and friends would point out, in rather ominous voices, “Uh-oh. You’re about to have an empty nest.” Is it wrong that I didn’t see a down-side to that? The angst of dreary days spent bemoaning the fast approaching “empty nest syndrome” just never happened for me. Instead, I took every opportunity to count my blessings and look forward to this transition. It was time. It was time for me to celebrate the fruits of my labor. It was time for my little nuts to stop clinging to my branches and find their own little patch of ground in which to take root. It was time for my little birdies to spread their wings and soar! OK, that’s a little bit of metaphoric over-kill, but you get my drift. Don’t get me wrong – I love my children to no end, and we are quite close. Aside from letting them move back in, there isn’t much that I wouldn’t do for them. In fact, when they were younger, I was the typical, in my son’s words, “over-protective dictator”. Looking back, I guess I can see how he would misinterpret my zealous attempts at parenting vigilance. Kids. They just don’t understand – until much later when they have their own. Linda Walter, LCSW, has an interesting article posted over on Psychology Today called “Empty Nest Without Feeling Empty”. In it, she addresses Empty Nest Syndrome, and shares a few helpful tips on ways to deal with the condition. Check it out if you think you may be at risk, or if you’re just curious. I was happy to find that several of the tactics I employed in my particular situation fit nicely with her suggestions, like the one on planning ahead. From the time they were in middle school, my children were told (with much love), “Go to school, or go to work – either way, you have to go.” I didn’t want them to be surprised when I gave them luggage for graduation. So far, the results have been positive, and my birdies are successfully learning to be independent and self-sufficient. 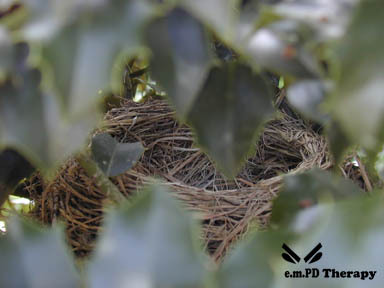 To top it all off — I have a pretty cool nest where I am free to spread my own wings. Win-win. Very inspirational. I wonder if that will be me in a couple years? Thank you Book Club Mom! And, it could happen… Just keep the lines of communication open so that everybody knows what to expect when the time comes. I wish you all the best in your future endeavor!